UPDATE: We launched! You can now order MAKE YOUR MARK notebooks from Leaders in Heels notebook page. a kind heart while becoming successful"
Women hold only 5.2 percent of Fortune 500 CEO positions. Gender pay gap in Australia is currently 17.5% and women hold 9.2% of ASX 500 directorships. that there were strong powerful female leaders in Australia …as well as women who were lacking confidence, afraid to articulate their career aspirations. What started as a humble blog in 2011 it now reaches 50,000 page views per month and have over 20,000 social followers run by 7 amazing people and over 30 regular contributors. Leaders" event promoting new modern approach to management and leadership through diversity. 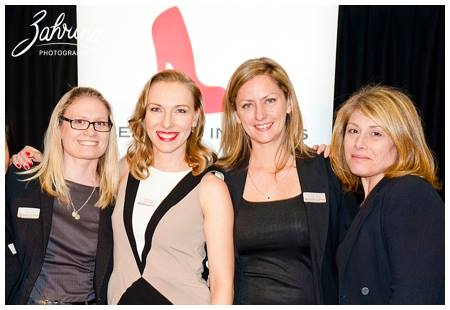 I have also attended over 100 networking, charity and educational events and workshops for women. me grow incredibly not just as a leader, but as an ambitious, confident, courageous woman." The answer is MAKE YOUR MARK. MAKE YOUR MARK is an everyday notebook with a simple goal in mind – to unleash a remarkable leader in every woman on Earth. Leaders in Heels Manifesto which, for me, is a road map to become a leader in every aspect of my life. The notebook MAKE YOUR MARK brings to life the Leaders in Heels Manifesto. and life. 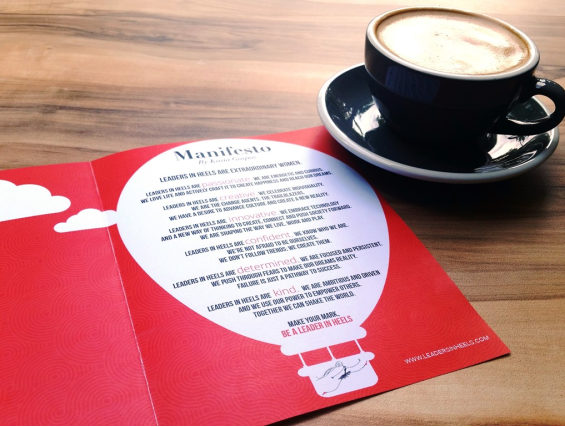 The manifesto is a road map to become a leader in every aspect of your life. "Every page of the notebook has been infused with quotes, thoughts and assignments to stimulate a new way of thinking. As you use the notebook daily and focus on each quality chapter by chapter, the traits become habits". passion, creativity, innovation, confidence, determination, kindness. 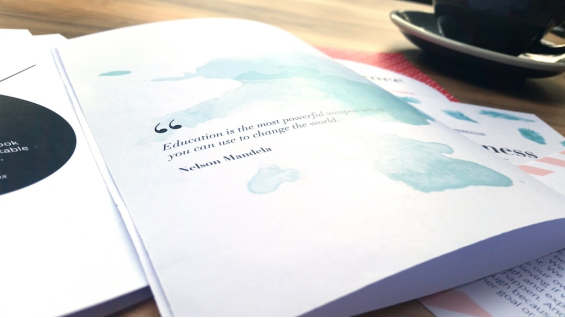 - Each chapter has thoughts and assignments designed to inspire a new way of thinking. - Each page has been infused with inspirational quotes directly related to these traits. - Plenty of room to make your own daily notes and thoughts, set your own goals and plan your life at its best. There are three more chapters: Passion, Creativity and Determination. a kind heart while becoming successful. they include complimentary Manifesto card. This will not be available after the campaign is finished. 3. Be the one who made this beautiful inspirational notebook available to the world. This is a perfect gift to inspire your staff or young girls and bring empowerment to every woman's life. skills and mentoring – free of charge – to improve their employability and achieve economic independence. By purchasing the notebook you can be sure that you are giving a gift not just to yourself but also to other women in need. 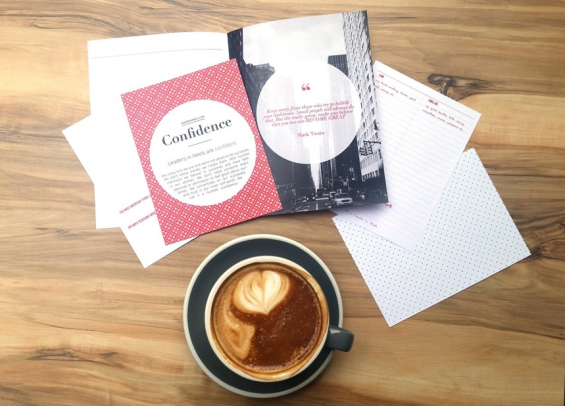 "I created this notebook to inspire you and wake up a leader in YOU." "Life is like a pen and you have the power to draw whatever you can imagine, but the ink is limited so make sure you use it wisely and create the life you love. Start crafting your ‘brand new’ from today. Forget about the past. Your future starts now." 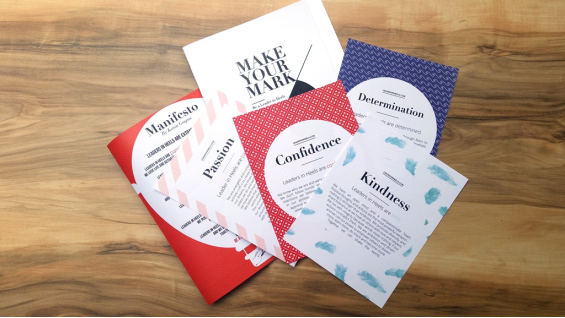 Simply order the MAKE YOUR MARK notebook for you and other amazing women in your llfe or choose one of the other rewards and perks. You can even join me for dinner or become a MAKE YOUR MARK patron. You can also show your love by sharing our campaign over social media using share buttons on this page, tweeting about the notebook, blogging about the campaign or reaching out to friends in a personal email. 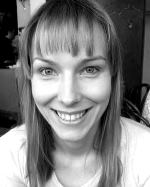 I am also happy to answer any questions if you would like to contact me for an interview or write a story. - Yolanda Floro - I know you will do everything to make this campaign a success! If we reach the tipping point 300 women will get empowered to Make Their Mark. $3,000 - to cover already committed costs like design, copywriting, proof printing, editing etc. If we reach the ultimate goal it means that 1,000 women will have had the chance to MAKE THEIR MARK! 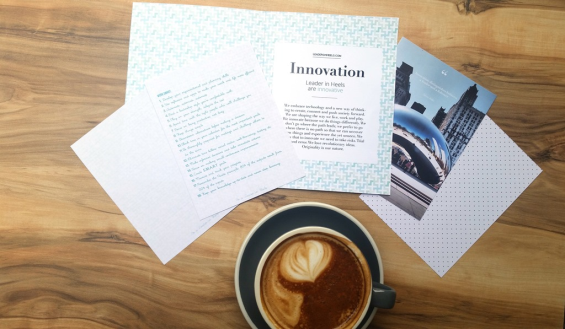 Inspirational Manifesto card (incl. worldwide shipping). Estimated delivery late November or early December 2014. Your name listed on Leadersinheels.com website as a Patron of the MAKE YOUR MARK Crowdfunding campaign. 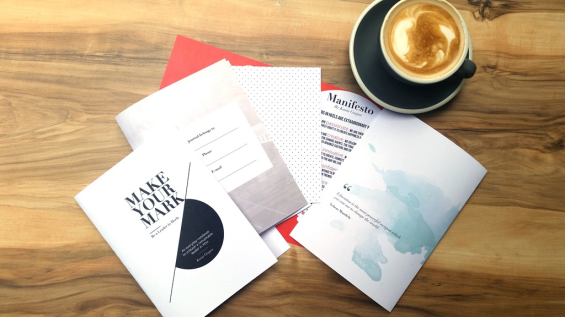 MAKE YOUR MARK Notebook + inspirational Manifesto card (incl. free shipping in Australia, add $6 for shipping outside of Australia). Estimated delivery late November or early December 2014. Just in time for Christmas. 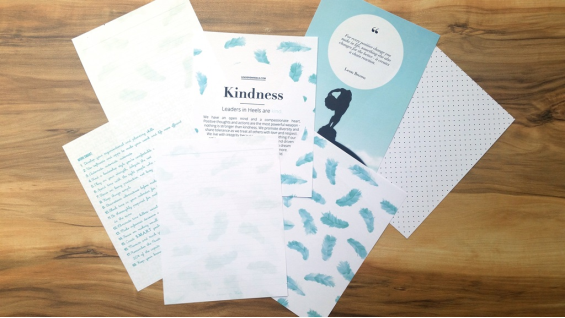 Personalized message & personally signed MAKE YOUR MARK Notebook + inspirational Manifesto card (incl. free shipping in Australia, add $6 for shipping outside of Australia). Estimated delivery late November or early December 2014. Just in time for Christmas. Twitter shout-out with thank you note to you broadcasted to 13,000 of @LeadersinHeels followers for supporting #MakeYourMark campaign. Your name and your business's name listed on Leadersinheels.com website as a Business Patron of the MAKE YOUR MARK crowd-funding campaign including link to your website. 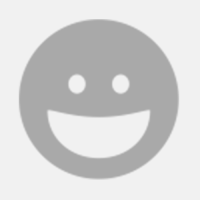 Great to make you feel good and for SEO! MAKE YOUR MARK Notebooks for you and 3 other amazing women in your life (i.e. 4 notebooks incl. free shipping in Australia, add $15 for shipping outside of Australia). Estimated delivery late November or early December 2014. Just in time for Christmas. Banquet dinner + a glass of champagne with me accompanied by the amazing Diana Ryall as the guest speaker in an intimate atmosphere in one of Sydney restaurants. Listen to Diana Ryall, former MD of Apple Australia and MD of Xplore for Success on how she become the CEO of Apple, how it was to work along Steve Jobs and what it takes to be a female leader + MAKE YOUR MARK notebook and opportunity to have it signed personally. Date: Monday 1st December 2014. Empower your team - Business Package: 20 MAKE YOUR MARK notebooks (note: shipping is not included, please contact us for shipping quote or arrange your own transport). Empower your staff - Corporate Package: 100 MAKE YOUR MARK notebooks + for first 10 orders your logo listed as an official Corporate Supporter of MAKE YOUR MARK crowd-funding campaign on Leadersinheels.com website (note: shipping is not included, please contact us for shipping quote or arrange your own transport).